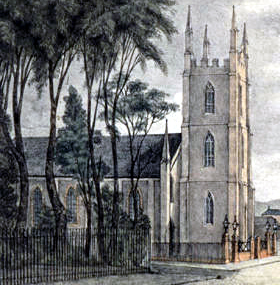 St Joseph’s Church was built in 1841 and opened and blessed by Father Therry early on Christmas morning 1841. The church is built of local sandstone and was designed by James Thomson, a former convict. Convict labourers were employed to carry out the work. The tower, 60 feet high, was finished in 1843 and the church building has not changed greatly since. In 1856 the sanctuary was improved, small sacristies behind the altar and a choir gallery above were removed and the present sacristies were built on the side of the church. The side chapel was built in 1877 as a choir for the Sisters of Charity, who lived from 1847 to 1957 in what is now the presbytery. During the 1930s the side chapel was replaced by the present red brick chapel, built by Jack Dunne. A small sandstone building, which had been used as a Sunday school for some years, was demolished at this time. Extensive restoration has been carried out during the past thirty five years. 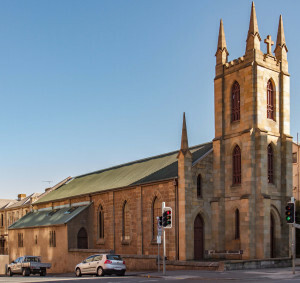 St Joseph’s is the oldest Catholic Church in Hobart and served as a cathedral while St Mary’s was being built. The first Bishop of Hobart, Robert William Willson was installed in St Joseph’s on 12 May 1844. The following year, he confirmed 500 people in the church. The old altar reredos is alabaster, delicately carved with scenes of the Annunciation and Nativity, with figures of Our Lady and St Joseph. The pillars are Irish Marble. It was made in London to a design by Douglas Salier of Hobart and installed in 1905 to replace the 1856 altar, which was wood painted blue and gold in medieval style. The present blackwood altar was made by Walter Nicholls in 1983, as was the President’s Chair and other blackwood refurbishments. He also made the large cabinet at the entry to the church in 1981 and the bookstand, both of old cedar from cedar pews dating from 1841, found in the gallery. The cedar pulpit was made in 1856 by Henry Hunter, architect in charge of the alterations. It was originally mounted on the wall above the sacristy door. It was later moved to a lower base and eventually placed on the far side in the sanctuary during the more recent renovations. The cedar bookstand was added in 1982. The large wooden crucifix also dates from 1856; the figure had been brought from Europe by Bishop Willson. It was supported by a rood screen, which was removed in 1959, except for the top and sides. The sanctuary walls were panelled in 1973 by Walter Nicholls, matching the design of the pulpit and reredos, but including the Passionist Emblem. The painting above the altar, “The Resurrection”, by Mather Brown, an American artist, was purchased in 1838 for the rented room used as a temporary chapel. In 1856, “Our Lady” and “St Joseph” by William Paul Dowling, an Irish political exile, were hung on either side. These paintings were removed on 4 September 2004 and taken to Melbourne for cleaning and restoration. They were reinstalled in the Church on 19 December 2005. Two large murals on the side walls of the sanctuary, “St Peter’s First Sermon” and “Feed My Sheep” were painted by Benjamin Sheppard. These were painted over in the 1930s but small sections have been rediscovered and hopefully will be restored as expertise and finance become available. The old sanctuary lamp, given to St Joseph’s in 1971, was used in Sydney by the first bishop, John Bede Polding. The Stations of the Cross in painted terra cotta, were purchased by the parishioners from France and installed and blessed by Father Hilary O’Meara CP on 2 July 1893. The carved statue of Our Lady of Fatima came from Spain in 1951, replacing the statue which had stood on the old altar of Our Lady beside the High Altar. The statue of St Joseph was donated in 1925. In 1982 a brass canopy was erected over the statues and the wall panelled in blackwood. The pews are New Zealand kauri pine made in 1891 and the bell in the tower is by Mears of Whitechapel, London, 1859. The stained glass windows were put in between 1856 and 1893 and with the exception of one, were made by Hardman and Scott of Birmingham, UK. The pair between the chapel and the confessionals are scenes from the life of St Joseph and were installed in 1871. One is in memory of Bishop Willson and his Vicar General, Dr William Hall, who both died in 1866 and includes their portraits. The other is in memory of Archdeacon George Hunter, who was ordained in this church in 1850. He was the brother of the architect Henry Hunter. Opposite on the Harrington St side, is a window in memory of Fr John Joseph Therry, founder of this church, given by his brother in 1877. It shows St Joseph and St John the Baptist with Fr Therry kneeling and wearing a cope. The window of the Annunciation and Nativity is the oldest in the church. It was installed in the Sanctuary wall by Bishop Willson in 1856 in memory of the English architect, A W Pugin, who had given the Bishop designs for churches. It was moved in 1877 when the chapel was built. The window over the sacristy door in memory of Fr Joseph Aloysius Sheehy, shows St Joseph, the Sacred Heart and St Aloysius and was made in 1893 by Lyon, Wells and Cottier of Sydney. The Sheehy family had been connected with St Joseph’s from the beginning. The garden beside the church and the building next door (161 Macquarie Street, bought in 1978) both commemorate Monsignor J H Cullen, who served the parish from 1910 to 1956. John Therry V G 1838-1844; William Hall V G 1844-1866; William Dunne V G 1866-1879; Charles Woods 1879-1896 (assistant from 1853, Dean 1882); Phillip Hennebry 1896-1921 (assistant from 1868 but with responsibility for New Town until 1888, Archpriest 1912); Bernard Murphy 1922-1933; John Cullen 1934- 1956 (assistant from 1910, V G 1944, Monsignor 1946, died 1970). The Passionist Fathers were asked to care for the parish in 1956. They lived in the old presbytery until the Sisters of Charity moved to Mount Carmel in Sandy Bay. The Congregation of the Passion was founded in Italy in 1720 by St Paul of the Cross. The Australian Province was established in 1887 and Passionist Fathers first visited St Joseph’s in 1891 to give a mission. They had a house in New Town from 1893 to 1895. Paschal Sweeney CP 1956-1957; John Cummins CP 1957-1959; Xavier Bates CP 1959-1968; Alphonsus Foley CP 1968-1970; Brian Gleeson CP 1970-1974; Joseph Furst CP 1974-1980; Allan Havelock CP 1980-1989; Christopher Mithen CP 1989-1992; Kevin Connelly CP 1992-1995; Peter Addicoat CP 1995-2004, Michael Hickey CP 2004-2005, Gerard Glynn CP 2006-2008, Aidan Kay CP 2008-2013, Peter Addicoat CP 2013 – .